In the vicinity of the hotel there is a payment garage handy for parking your car. 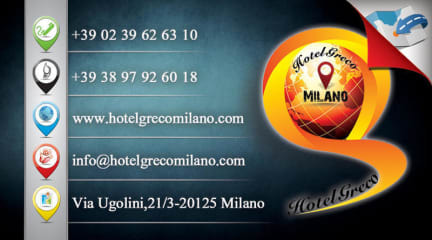 If you are interested in Milan night-life from Hotel Greco’s reception you can find out all the information you need to have a great time. You don't need to spend your night wandering about pubs and restaurants. - Credit card accepted (Visa, MasterCard and American Express) with 3% of bank commissioning. 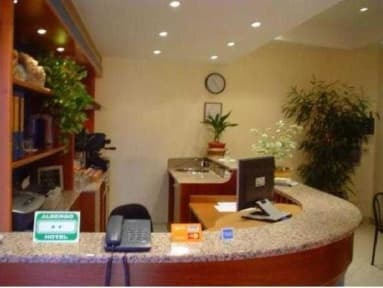 This property may preauthorize your credit card in order to confirm your booking. Lovely little place! Clean and tidy, and the staff is amazing. Every thing was very good, i will come back for sure. Everything was great, staff was friendly, room was clean. Only one problem was wi-fi: first day it worked, but then something happened with it. But everything else was good. The staff was wonderful! We are so glad we stayed there. The price was very high, but everything in Milan was much more expensive than normal due to a huge furniture convention. It is less than 10 minutes to the metro, which is very easy to use. It is away from the loud and hectic part of town, in a less touristy area. Some may not like that but we felt very safe and comfortable. It was very cute and comfy but there were no signals on how to get there and since it looks like a regular house we didn’t want to go in haha. But overall a good experience. We reserved the night online, but never stayed. When we arrived the guy behind the counter did not have our reservation. He said it should not charge if it didn't send me number, but we got charged initial hold fee. He was helpful but could do nothing. He could not refund the charge since he had no number. The place was dark and far and not lit very well. This hostel is located in a totally dead area of Milan. There is nothing at all happening here, and it felt quite unsafe at night. The room itself was small but clean, although it had a smell of mould which was visible in the shower. The wifi was hard to connect to in the room, which was frustrating. The staff offered no suggestions for things to do/see/places to eat, and we usually had one word interactions. We were really disappointed, and I wouldn't recommend anyone staying here.